1) (Belview, co. Fermanagh, granted 1819 to Henry Nugent Bell, Esq., and the descendants of his grandfather, Walter Bell, of Gortadrate, co. Fermanagh). Az. a fesse erm. betw. three bells or. Crest—On a ducal coronet or, a falcon rising ppr. collared gu. belled gold. 2) (Overton, co. York). Gu. on a chev. ar. betw. three bezants, a cross pattee fitchee, on either side a mullet az. pierced of the second. 3) (Bourne Park, Kent). Sa. on a chev. betw. three bells ar., as many lions’ heads erased gu. Crest—A lion’s head erased. 4) (Thirsk Hall, co. York). Per chev. az. and sa. a chev. engr. with plain cottises betw. three bells ar. Motto—Inopem me copia fecit. 5) (Woolsington Hall, Northumberland). Sa. a fesse erm. betw. three bells ar. Crest—A hawk close ppr. belled or. 6) (Sunderland, co. Durham). Sa. a chev. erm. betw. three church bells ar. Crest—A hawk close ppr. beaked and belled or. 7) (Berkshire and Buckinghamshire). Sa. three church bells ar. two and one and. three estoiles or, one and two Crest—A hawk with wings expanded ar. beaked and belled or, with a string flotant from the bells gu. 8) (Essex). Erm. on a chief sa. an escallop shell betw. two bells ar. Crest—A talbot pass. erm. 9) (Essex). Erm. on a chief sa. three church bells ar. 10) (Gloucestershire). Ar. on a chev. betw. three hawks’ bells gu. two bars gemelles of the first, on a chief of the second a hawk’s lure betw. two martlets of the field. Crest—An arm embowed vested gu. holding in the hand ppr. a battle-axe staff gu. head ar. 11) (Jamaica). Az. a fesse engr. betw. three bells or. Crest—A stag’s head erased gu. attired ar. Motto—Fulget virtus. 12) (London). Az. on a chev. ar. betw. three lions’ heads erased or, gorged with a collar of the first charged with three bezants, as many church bells of the field ornamented of the third. 13) (Haughley, co. Suffolk). Ar. two chev. engr. vert each charged with three trefoils slipped or, betw. three talbots’ heads erased gu. (another, the chev. engr.). 14) (Lord Chief Baron of the Exchequer, who died 1557). Sa. a fesse erm. betw. three church bells ar. 15) (London). Arms, the same. Crest—A. human heart betw. two wings. Motto—Forward, kind heart. 16) (Newcastle). Arms, the same. Crest—A hawk close ppr. beaked and belled or. Motto—Perseverantia. 17) (Spencer-Bell exemplified to James Bell, Esq., of Fawe Park, co. Cumberland, on his assuming, by Royal Licence, the additional name and arms of his wife, the only dau. of Jeremiah Spencer, Esq., of South Lodge, Cockermouth, and eventually sole heiress of her brother). Quarterly, 1st and 4th, erm. on a chief sa. an escallop betw. two church bells ar., for Bell; 2nd and 3rd, quarterly, ar. and gu. in the second and third quarters a fret ar. over all on a bend sa. three escallops of the first, for Spencer. Crests— 1st: A beaver statant erm., Bell; 2nd: Out of a ducal coronet or, a griffin’s head ar. collared gu. betw. two wings expanded of the second. Motto—Spencer, Dieu defend le droit. 18) (Northumberland and Cumberland). Gu. on a chief ar. three churchbells sa. 19) (Westmorland and Cumberland). Sa. a chev. betw. three church bells ar. 20) (Kirkconnel, co. Dumfries). Az. three bells or. 21) (Provosthaugh, co. Dumfries). Az. a fesse betw. three bells or. Crest—A roe feeding ppr. Motto—Signum paeis amor. 22) (Ealing, 1782). Az. a fesse engr. betw. three bells or. Crest—A. stag’s head ppr. attired or. Motto—Signum pacia amor. 23) (Fortoun, co. Haddington, 1855). Or, betw. three bells az. an oak tree eradicated vert surmounted of a fesse of the second, charged with a star of six points betw, two crescents of the field. Crest—A stag’s head erased ppr. Motto—Ardenter amo. 24) (Beaupre Hall, co. Norfolk; descended from Sir Robert Bell, Chief Baron of the Exchequer, and Speaker of the House of Commons, who died on circuit at Leominster, co. Hereford, 25th July, 1577). Sa. a fesse erm. betw. three bells ar. quartering, ar. on a bend az. three crosses crosslet or, for Beaupre. 25) (Yorkshire). Sa. on a chev. betw. three church bells ar. as many lions’ heads couped gu. 26) Gu. a fesse erm. betw. three church bells ar. Crest—A falcon close, belled or. Motto—Prend moi tel que je suis. 27) Az. a fesse erminois cottised or, in chief two martlets of the last. Crest—On a rock ppr. a martlet erminois. 28) Sa. a fesse erm. betw. three church bells or. 29) Sa. a fesse erm. betw. three mascles (another, martlets) ar. 30) Az. a fesse betw. three church bells or. 31) Per chev. gu. and or, a crescent counterchanged. 32) (Borne by Sir Thomas Bell, Knight, of Cranford, Middlesex, Sheriff of London, 1823) Az. three church bells or, two and one, a chief, erm. Crest: A portcullis ppr. 33) Crozier’s General Armory (1904) contains one entry for this name: William Bell of Massachusetts, 1737, from Scotland. Azure, a chevron ermine, between three bells or. Crest: A falcon, wings expanded, ermine. Motto: Nec quaere honorem nec spernere. The popular primarily Scottish/English last name Bell has several origin theories. First, it may be an occupational surname, denoting a person that rang a bell (in church services?) or made bells, deriving from the Middle English word bell or Old English word belle, both meaning bell. Second, it might be a topographic surname for a person who lived near an actual bell. Bells were used for hundreds of years to single workers start and stop times, to summon meetings, and to sound alarms as well as in religious rituals. Third, it could be a surname that derived from the medieval personal (first) name Bel and was a baptismal/patronymic name meaning “the son of Bell”. Fifth, it may have been a name denoting a beautiful person deriving from the French le bel. Fifth, in some instances, it is an Anglicized spelling of the Gaelic surname Mac Giolla Mahoul, meaning “the son of servant of the devotee”, as well as Anglicized or Americanized spellings of foreign names (ex. the German last name Böhl or Böll). 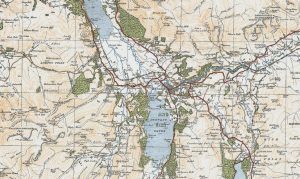 It is believed the family first held lands and titles in Dumfriesshire, Scotland and descended from Gilbert le fiz Bel, who owned land in Annandale, and later moved to Middlebie in Dumfiresshire, after having lost territory. The name was also borne by a family in the old French region of Gascogne (which was located near Spain). Clanmacmillan.org states “Most of the earliest Bells recorded in Scotland were associated with the church at Dunkeld, where Gilchrist Maolan’s father had been the bishop, and the largest branch of the sept were latter to be found in Glens Aray and Shira” and “and the first record of a Bell coat of arms in the Borders (the seal of Robert Bell in Berwickshire in 1427) is identical in design to the unadorned form of the Galloway MacMillan’ arms. However, by the 16th century the many bearers of the name Bell in Dumfries-shire and the Borders were recognised as a clan in their own right by the Scottish crown, and DNA evidence points to some of the later Border Bells being of English origin. The traditions of the Bells of Kirkconnell, the leading Border family of the name in the 15th century speak of an ancestor that came from France with the Earl of Douglas in the previous century”. George Fraser Black’s 1946 book The Surnames of Scotland, states the following in regard to this last name: “The name was common on the Border for centuries, and the ‘Beilis’ are included in the list of unruly clans in the West Marches, 1587. The Bells of Annan dale are said to be descended from Gilbert le fiz Bel, who was deprived of his lands by Edward I. Families of the name long predominated in the parish of Middlebie insomuch that the ‘Bells of Middlebie’ was a current phrase throughout Dumfriesshire. In the index to REB. the name is confused with the place name Biel. Patrick de Dunbar dominus de Bele is indexed under Bell. Robert Bell, born in Scotland, printer of the first edition of Thomas Paine’s Common sense died in Virginia, 1784. Rev. Patrick Bell (1800—1869) was inventor of the reaping-machine and founder of mechanical harvesting”. Common spelling variants or names with similar etymologies include Bel, Belle, Bele, le Bel, and le Bell. Similar non-British names include Beli (Norse), Bela (French), Bel (Dutch), and Baele/Beli (Flemish). The last name Bell ranks 67th in popularity in the United Status as of the 2000 Census. The name ranks particularly high in the following seven states: Georgia, Michigan, Mississippi, Tennessee, Alabama, Maryland, and Kansas. The surname Isaac frequency/commonness ranks as follows in the British Isles: England (60th), Scotland (43rd), Wales (115th), Ireland (482nd) and Northern Ireland (24th). In England, it ranks highest in county Cumberland, Northumberland, and Durham. In Scotland, the Bell surname rankest highest in Dumfriesshire. In Wales, it ranks highest in Anglesey and Merionethshire. In Ireland, it ranks highest in Cavan. In Northern Ireland, it ranks highest in county Down and Antrim. The name is also present throughout the remainder English speaking world: Canada (77th), New Zealand (46th), Australia (46th), and South Africa (366th). The 1890 book Homes of Family Names by H.B. Guppy, states the following in regard to this surname: “This surname probably, in most cases, has been derived from the Norman name Le Bel (the handsome man), which is to be found in the Hundred Rolls of the thirteenth century, mostly in Oxfordshire, and is at the present time well represented in the neighbouring counties of Northampton and Bucks. Its habitation in the Midlands is, however, of small importance, in comparison with the great home of the Bells in the English and Scottish counties on and near the border, namely, in Northumberland, Durham, Cumberland, Dumfriesshire, and the neighbouring Scottish counties, where they have herded for more than three centuries”. The earliest known bearer of this surname was Ailuuardus filius (son of) Belli in 1086 AD. Seaman Belle was recorded in around 1183 AD. Serlo Belle was documented in the Pipe Rolls of Yorksire in 1190 AD. Roger del Bel was listed in the Pipe Rolls of Norfolk in 1209 AD. Robert de la Belle was documented in London in 1222 AD. The Hundred Rolls of 1273 AD, a census of Wales and England, known in Latin as Rotuli Hundredorum lists three bearers of this surname: Ralph le Bele (Cambridgeshire), Hugh le Bel (Oxfordshire), and Thomas le Bel (Suffolk). Robert le Bell was the mayor of the city of Bristol in 1239 AD. A one Roger atte Bell was documented in county Somerset in 1327 AD in Kirby’s Quest. John atte Belle is recorded in the Camden Society Publications. The Writs of Parliament document one Richard atte Bell in 1307 AD. John atte Bell recorded was recorded in the Memorials of London. An early marriage involving this surname was Margarett Bell to Wylliam Traford at St. Mary’s Westminster in London in 1551. An early baptism involving this name was Mary Bell at St. Peter’s, Cornhill, London in 1541. Burke traces the Bell genealogy of this branch of the Bell family tree back to John Bell, Esquire of Kendal, Westmorland, England who was born in 1733, son of Matthew Bell of Kendal and Anges Yeates. He worked in the law profession and attained great prominence at the Chancery Bar, and was made King’s Counsel. He married Jane, daughter of Henry Grove, and with her had a son named Matthew Bell. Matthew Bell, Esquire of Bourne Park, Kent was born in 1817 and educated at Trinity College Cambridge. He was a Justice of the Peace, Deputy Lieutenant, and High Sheriff in 1850. In 1839, he married Fanny-Cecilia, youngest daughter of Thomas Bigge, Esq. of Benton, Northumberland and had ten issue with her: 1) Matthew-John (born 1840, served in 13th Light Infantry, married Kathleen Matilda Reilly), 2) Edward Shurland (born 1841), 3) Charles George (born 1843, 23rd Royal Welsh Fusiliers, married Emma Frances Beresford Whyte), 4) Herbert James (1853), 5) Florence Jane (married Allen George Douglas, Captain in H.M. 9th Regiment, son of Henry Hamilton Douglas), 6) Fanny-Alice (married Charles Stewart Hardt), 7) Augusta Rose (married William Gaven Eden), 8) Eleanor Margaret (married Reverend Arthur-Ellison Molineux), 8) Constance Georginia (married Major Frederick Thomas Whinyates), and 9) Getrude Cecilia. The Bell Coat of Arms (mistakenly) called the Bell Family Crest is blazoned in heraldry as follows: Sable, on a chevron, between three bells argent, as many lions(?) head’s erased. Crest: A lion’s head erased proper. They were seated at Bourne Park, Canterbury, Kent, England and bore the family motto Lege er labore. 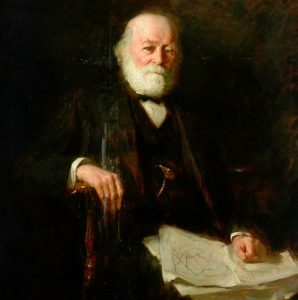 Frederick Bell, Esquire of Thirsk Hall in county York was born in 1830, the son of Reverend Macbean, and succeeded his maternal uncle, John Bell, in 1850, whereupon he assumed the name of Bell in lieu of Macbean. He was a Justice of the Peace, Deputy Lieutenant, and Captain of the North York Rifle’s. He died in 1875 without leaving posterity. 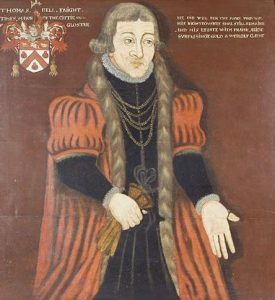 Burke traces the Bell ancestry back to Ralph Bell of Thrisk, a Member of Parliament for that Borough, and Lord of the Manor, who married Rachel Smyth, with whom he had four issue: Ralph, Peter (married daughter of Richardson Ferrand), Elizabeth (married Robert Livesey), and Mary. His son and heir was John Bell, who was born in 1764. In 1800, John married Frances Brady, daughter of William Barnett of Areadia, Jamaica, and had four children with her: Ralph, John, Frances (married Reverend William MacBean), and Jane (married Captain William Bayntun and Major Charles O. Sanders). He was succeeded by his son and heir John Bell who was a Member of Parliament for the borough of Thirsk, as well as Justice of the Peace and Deputy Lieutenant. He died in 1857, having passed the estate to his nephew, Frederick MacBean (mentioned above). The Bell Coat of Arms (erroneously called the Bell Family Crest) has the following heraldic blazon: Per chevron azure and sable; a chevron engrailed, with plain corrises between three bells argent. The Bell family motto for this branch of the Bell family tree is Inopem me copia fecit. Henry Bell, Esquire of Woolsington, Northumberland, formerly Captain 29th and 36th regiment, was born in 1803. In 1831, he married Helen, only daughter and heiress of Sir William-Babenal Burdett, 3rd Baronet. Burke traces the lineage of ancestry of this branch of the Bell family tree back to Matthew Bell, of Newcastle-onTyne, who married the daughter of Salkeld, and had two issue: Elizabeth (married John Stephenson) and Matthew. His son Matthew was an Esquire, Alderman of Newcastle, High Sheriff 1736, and Mayor in 1757. He married Jane, daughter of Richard Ridley of Heaton, ancestor of Sir Matthew White Ridley. Together they had a son named Matthew Bell, Esq. of Woolsington and a Colonel of the Northumberland Militia. In 1767, he married Dulcibella, daughter of Sir John Eden Baronet of Windlestone, and had three daughters with her and four sons (Matthew, Stephen, Robert, and Henry). The eldest son was Matthew who became High Sheriff of Northumberland in 1797. In 1792, he married Sarah Frances Brandling, and had the following issue with her: Matthew, Charles (married Mary Brandling and Rachel Brandling), Robert John, Henry, Reverend John (Vicar of Rothwell, married Isabella, daughter of Sir Charles Loraine), William (married Jane Ridley), Elizabeth Jane, Dulcibella, and Frances (married Sir John James Walsham). 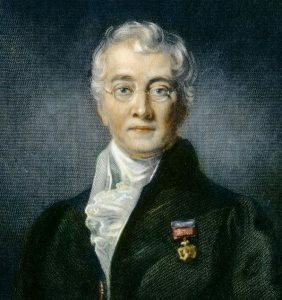 He died in 1811 and was succeeded by his eldest son, Matthew Bell, Esquire of Woolsington, who was born in 1793 and was Justice of the Peace, Deputy Lieutenant, High Sheriff, and Member of Parliament for Northumberland. 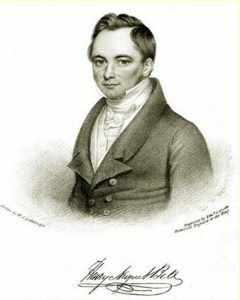 In 1816, he married Elizabeth Anne, daughter and heiress of Henry Utrick Reay of Killinworth, and died without issue, whereupon he was succeeded by his next surviving brother. The Bell Coat of Arms is blazoned as follows: Sable, a fess ermine, between three bells argent. Crest: A hawk proper, belled or. They were seated at Woolsington, Newcastle-upon-Tyne and Killingworth House, both in Northumberland, as well as Hanwich Hall in county Durham, England. Sir Eastman Bell, 2nd Baronet, of Mynhurst, Reigate, Surrey, Barrister-at-law, the Inner Temple, was Captain of the Surrey Yeomanry and Director of the Buenos Ayres Great Southern Railway Company. He was born in 1884 and succeeded his father in 1931. Burke traces the lineage back to Archibald Bell of Glasgow who was born in 1806. He married Christian, daughter of David McQueen of Glasgow. He later married Helen, daughter of John Colquhoun of Luss,, and had two issue with her: Sir Henry (created a Baronet in 1909) and Sir James (created a Baronet in 1895). He died in 1881 and was succeeded by his eldest son, Sir Henry Bell, 1st Baronet, who was Justice of the Peace and Director of the Buenos Ayres Great Southern Railway Company, born in 1848. In 1883, he married Lizzie French, daughter of Timothy Courser Eastman, of New York, and had three children with her: Sir Eastman Bell (2nd Baronet, mentioned above), Henry James (Major of the late Surrey Yeomanry, served in World War I), Lucy and Putnam (married Maurice FitzGerald). He was created a baronet in November of 1909 and died in 1931, when he was succeeded by his eldest son. The Bell Coat of Arms (mistakenly called the Bell Family Crest) has the following heraldic blazon: Azure, on a fesse engrailed argent between two bells in chief and in base a three masted ship of war all or, a rose gules. Crest: A stag’s head, or, charged on the neck with a thistle slipped proper. The family motto is Signum pacis amor. Sir Hugh Francis Bell, 4th Baronet, of Rounton Grange, county York, was born in 1923 in Johannesburg, South Africa, and was a Lieutenant who served in World War II. The lineage or ancestry traces back to Thomas Bell, Alderman of Newcastle-on-Tyne, Northumberland, who was born at Lowhursr, near Carlisle in 1784. In 1815, he married Katherine, daughter of Isaac Lowthian of Newbiggin, and had issue, the eldest son of which was Sir Isaac Lowthian Bell, 1st Baronet, of Rounton Grange, county York and Washington Hall in county Durham. He was Justice of the Peace, Deputy Lieutenant, and High Sheriff. He was born in 1816 and in 1842, married Margaret, daughter of Hugh Lee Pattinson, and had children with her, one of which was Sir Thomas Hugh, the 2nd Baronet. Sir Thomas Hugh Bell, 2nd Baronet, was born in 1844. He was a Lieutenant of North Riding, Yorkshire, as well as a Justice of the Peace and Deputy Lieutenant for county Durahm, as well as High Sheriff. In 1867, he married Maria, daughter of John Shield of Ashburn, Isle of Bute, and had two issue with her: Sir Maurice High Lowthian (3rd Baronet) and Gertrude Margaret Lowthian (author and Arabic scholar). He later married Florence Eveleen Eleanor, daughter of Sir Joseph Olliffe, and had issue with her: Reverend Hugh Lowthian (married Frances Helena Morkill), Florence Elsa (married Admiral Sir Herbert William Richmond), and Mary Katharine (married Sir Charles Philips Trevelyn). Sir Hugh died in 1931 and was succeeded by his eldest son, Sir Maurice Hugh Lowthain Bell, 3rd Baronet, who was Justice of the Peace and Deputy Lieutenant for North Riding, Yorkshire and High Sheriff for county Durham in 1921. He was also Colonel of the 4th Bn. Yorkshire Regiment, and a Captain in the Army who served in South Africa in 1900 and in World War I. The Bell Coat of Arms is blazoned in heraldry as follows: Argent, on a fesse between three hawks’ lures azure, as many hawks bells of the first. Crest: A hawk or, holding in the beak a hawks lure azure and resting the dexter claw on a sun splendor. The family motto was Perseverantia. 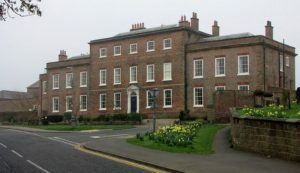 They family was seated at Rounton Grange and Arnclisse Hall, both in Northallerton, York, England. Sir Charles Reginald Francis Morris-Bell, 3rd Baronet, of Otterburn Hall, was born in 1915 and succeeded his father in 1943. He was Captain of the XII Lancers and served in World War II. Burke traces the genealogy of this branch of the Bell family tree to John Bell, of Nether Steele and Blackbank, in Allendale, Northumberland. In 1744, he married Elizabeth Kirk, Allendale, and had several issue with her, including a son named William Bell. This William was of Steele, Allendale, and afterwards of Anfield House Lanchester, county Durham was born in 1744. In 1778, he married Jane, eldest daughter of John Kirsopp, of Conside and had issue with her, including a son, also named Willaim Bell. 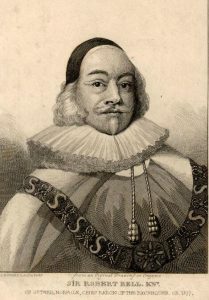 William Bell of Ford Hall, Sunderland in county Durham, was Justice of the Peace, and Vice Admiral for the County Palatine of Durham. He was born in 1779 and in 1828, he married Mary Wilhelmina, daughter and heir of John Morrison of Alston, and had issue with her. The eldest son of this marriage was Sir Charles William Morrison-Bell, 1st Baronet, of Otterburn Hall, Elsdon, county Nothumberland, who was Deputy Lieutenant for Durham and Justice of the Peace of Sussex, Wiltshire, and Northumberland, as well as a Lieutenant of the 15th Hussars. He was born in 1833 and in 1863, married Louisa Maria, daughter of William Henry Dawes and had four sons (Claude William Hedley, Arthur Clive, Ernest Fitzroy, and Eustace Widdrington) and two daughters (Evelyn Beatrice and Muriel Blanche Gwendoline). The Bell Coat of Arms is blazoned as follows: Quarterly, 1st and 4th, sable on a fesse ermine between three bells argent, a falcon close between two crescents of the field (for Bell); 2nd and 3rd argent on a fesse azure between three moors heads couped at the neck, the turbans very, turned up argent, three roses or (Morrison). Crest: 1st: for Bell, a falcon close proper belled or, holding in the beak a bell as in the arms, 2nd for Morrison: In front of a moor’s head couped at the shoulder as in the arms, three roses gules. This branch of the Bell family tree was seated at Highgreen, Tarset, Northumberland, and Glendoe, Corge Mullen, Wimborne. Sir Arthur Clive Morrison-Bell, 1st Baronet of Harpford, county Devon was orn in 1871 and created a Baronet in 1923. He was a Major in the Scots Guard and a Member of Parliament of Devonshire from 1910-1931. He served in the South African War (1899-1900) and World War I. He was the second son of Sir Charles William-Morrison Bell, 1st Baronet of Otterburn. In 1921, he married Lilah Katherine Julia Wingfield, daughter of the 7th Viscount of Powerscourt, and had three issue with her: Shelagh Jocelyn (married William Cooper Moore), Deirdre Pamela Clare, and Patricia Louisa (married Major John Neville Wake Gwynne). James Bell, age 19, came to St. Christopher’s aboard the Ann & Elizabeth in 1635. Thomas Bell, age 14, came to St. Christopher’s aboard the Mathew in May 1635. Thomas Bell, age 17, came to Virginia aboard the Thomas & John in June 1635. Joseph Bell, age 30, came to Virginia aboard the Safety in August 1635. John Bell, age 21, came to Virginia aboard the George in August 1635. William Bell owned 25 acres of land in the Sommer Islands in the second half of the seventeenth century. Frances Bell owned 12 acres of land and 8 slaves in the Barbados in 1679. Robert Bell was buried St. James in Barbados in May 1678. 1) Francis Bell of Stamford, Conneticut, had been early at Wallingford and was a Lieutenant 1666, but not a freeman before 1676, though he was admitted to that of New Haven Col. In 1647. He married a woman named Rebecca and had a son with her named Jonathan. 2) James Bell of New Haven, CT, who was the brother of Abraham, and took an oath of fidelity in 1644. He had children named Jane (1658), John (1660), James (1663), Nathaniel, Sarah, Elizabeth, Mary, Joseph, and Esther. 5) Thomas Bell of Roxbury, MA, was a freeman in 1636. He had two issue: Sarah (1640) and John (1643). Other early settlers in colonial America bearing this surname include Alexander Bell (Virginia 1654), Christian Bell (Virginia 1650), George Bell (Virginia 1638), Anne Bell (Virginia 1713), Christopher Bell (Virginia 1716), Aaron Bell (New England 1719), and Simon Bell (Pennsylvania 1734). In Canada, one of the first bearers of this last name was Ann Bell who came to Nova Scotia in 1750. In Australia, one of the first bearers was John Bell, a convict from Middlesex, England who came aboard the Asia in 1820 and settled in New South Wales (then a penal colony). In New Zealand, George Bell arrived at the Island of Mana in 1832 aboard the Minerva. 1) Az a chev erm bet 3 bells or Crest: a falcon with wings expanded erm. Motto: Nec quaerere honorem nec spernere Tombstone in the Newport, R. I., churchyard ( 1737) erected to the memory of William Bell. ‘Vermont’s Amer. Heral., pp. 41, 157. 2) Az a fess erm bet 3 bells or Crest: a falcon.Motto: Nec quaerere honorem nec spernere Bookplate Charles H. Bell, Gov. N.H.
3) Az 3 church-bells [or?] Crest: figure of Justice holding sword in dexter and scales in sinister hand Motto: Honor virtutis prœmium Bookplate William Bell, N. H.
4) Sa 3 bells 2 and 1, and 3 estoiles 1 and 2 Crest: an eagle rising. Bookplate John Bell. Also memorial tablet to Isaac Bell and his wife in Trinity Church, N. Y. Motto: Perseverance. See also Mott. Crozier’s General Armory (1904) contains one entry for this name: William Bell of Massachusetts, 1737, from Scotland. Azure, a chevron ermine, between three bells or. Crest: A falcon, wings expanded, ermine. Motto: Nec quaere honorem nec spernere. 3) Richard Bell of Gray’s Inn, Counsellor-at-law, and residing in the city of York, 17 November 1612, by St. George Norr. There are hundreds of notable people with the Bell surname. This page will mention a handful. Famous people with this last name include: 1) Arthur William Bell (1945) who is an American radio broadcaster from Pahrump, Nevada who was known for hosting the paranormal radio show Coast to Coast AM, 2) James Franklin Bell (1856-1919) who was born in Shelbyville, Kentucky and was Chief of Staff of the United States Army from 1906 to 1910 who served in the Spanish-American War, 3) Alexander Graham Bell (1847-1922) who was a Scottish born scientist, engineer, and inventor who is credited with patenting the first practical telephone, 4) Roy Chester Bell (1907-1977) who was a professional baseball player in the MLB who played for three different teams: St. Louis Browns, Detroit Tigers, and Cleveland Indians, 5) Sir Charles Bell (1774-1842) who was a Scottish surgeon and anatomist who is credited for discovering the difference between sensory and motor nerves, 6) Rear Admiral Charles H. Bell (1798-1875) who was an United States Naval Officer who served in three wars: the War of 1812, the Second Barbary War, and the American Civil War, 7) Charles Henry Bell (1823-1893) who was an American lawyer who became a United States Senator from New Hampshire in 1879, 8) Sir Francis Dillon Bell (1922-1898) who was a New Zealand politician who was the third Minister of Finance and the third Speaker of the House, 9) Sir Francis Henry Dillon Bell (1851-1936) who was the first New Zealand-born Prime Minister of Zealand in 1925, 10) Henry Glassford Bell (1803-1874) who was a Scottish poet, historian, and lawyer from Glasgow, and 11) Kristen Anne Bell (1980) who is a famous American actress born in Huntington Woods, MI who is known for her rolls in Forgetting Sarah Marshall, Couples Retreat, and The Boss. 12) Sir James Bell, shipowner and former Lord Provost of Glasgow bought the estate in 1895. 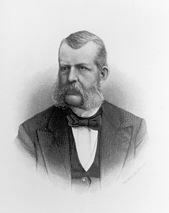 He was Chairman of the G&SWR from 1915-1920. He died at Montgreenan in 1929. The main heraldic symbol within the various Bell coats of arms (often erroneously called the Bell family crest) is, of course, the bell. 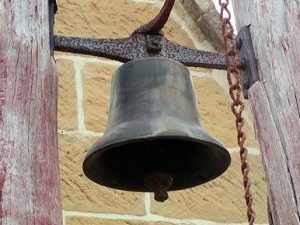 The bell usually represents the church bell, which is shown in a realistic, shaded form and may have a clapper of a different colour. In the middle ages Church bells were believed to have the power to disperse evil spirits and to summon guardian angels and we can assume a similar meaning for their depiction in a coat of arms.